Bill Garcia is regarded as the “Godfather of Stereo Rock & Roll Radio in Tampa Bay.” He burst into the scene in December of 1973 as Program Director and Mid Day Jock at Q105. He was the first to broadcast Rock & Roll in stereo in Tampa Bay. Within months of his arrival, Bill had dominated the market, tearing down WLCY and WDAE FM 101 and anything else broadcasting in Tampa Bay. Featuring acts like Cleveland Wheeler, Tim Davisson, Uncle Johnny and Chuck Stevens, Garcia showed the Bay area what radio was all about. The rest is history as Q105 went on to become the ratings monster for years to come, not surrendering the title until 1990 when the Power Pig dethroned them. Bill was gone before then. 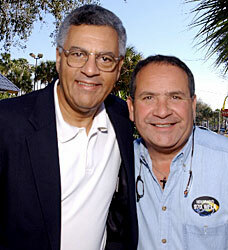 At left: Bill Garcia & Tedd Webb in 2004, Bill stole Tedd away from Q105 in 1983 when he was Program Director at WFLA, helping to launch the Sports Huddle Radio show in 1983. Since leaving Tampa Bay, Bill has worked in radio sales and is now working for: The Associated Press Regional Radio Executive CRMC, Large Markets out of Boston, still being involved in the broadcast industry. 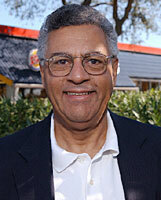 A great programmer and a terrific on-air talent, Bill Garcia earned his place in the Tampa Bay Radio Hall of Fame.